Montreal is a city with no shortage of great restaurants. We constantly innovate and push the boundaries of what gourmet dining can mean. As an influential leader in Montreal’ extensive restaurant scene, Queue de Cheval will be reopening its doors in a few short weeks after a heavily lamented absence. Known for their unbeatable steak, five star service and luxurious atmosphere, Queue de Cheval is one of Montreal’s most iconic restaurants. Between now and the hotly anticipated opening, the folks behind the famous eatery have done something truly outstanding which is peaking interest around the city. 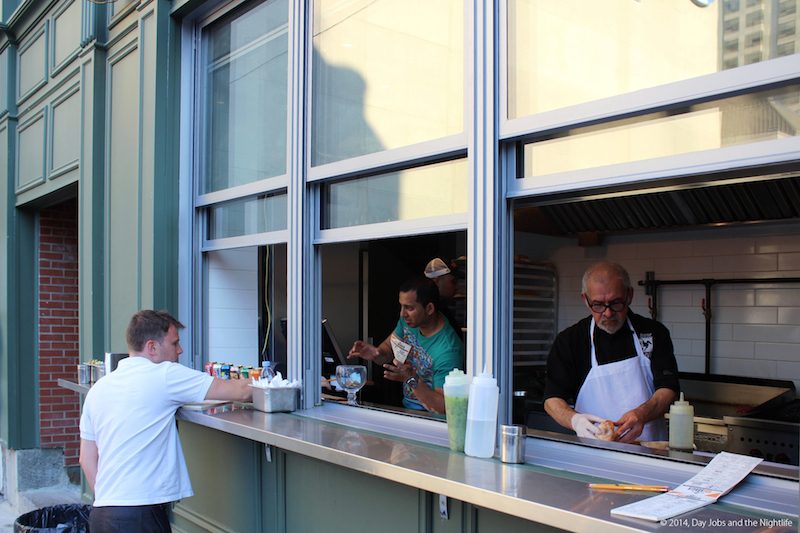 They’ve opened a burger joint in the ally behind the restaurant and we were there last Friday night for a taste. Here’s the 4-1-1. 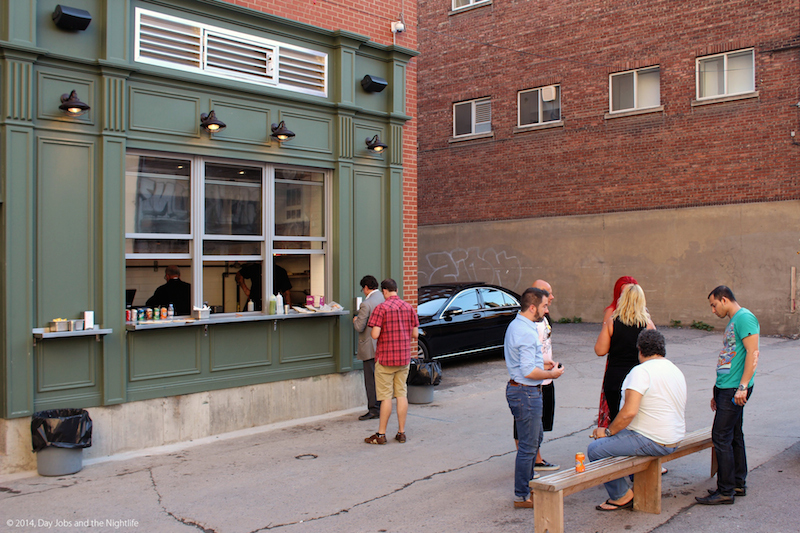 It was one of those perfect Montreal summer evenings when we arrived at the front entrance of Queue de Cheval. Despite knowing that QDC Burgers was located at the back end of the restaurant, we wanted to make sure there wasn’t a magic front door. For the time being there’s no indication on the main street that QDC Burger exists. You have to be in the know and be enterprising enough to take a few steps to the back of the building where the smell of sizzling beef confirms that the chatter about the burgers was not a dream. Though I knew that QDC was in the back of the restaurant I didn’t expect it to be literally in the back of the building. We strolled around back to find a few curious people gathered around a large window with four men inside the small yet very functional kitchen happily taking food orders. While Queue de Cheval is known for it’s exquisite ambiance, QDC Burger doesn’t rely on fancy cloth napkins and silverware to create atmosphere. Montreal’s natural vibrancy is the atmosphere, it’s you and me and the crowd that comes, mingles and enjoys good food. I can’t think of any better way to drum up a cooler place in the city. For now there is one rickety wooden bench where people can sit, share their food and chat (when they are not silenced while devouring the food) but more benches are coming soon. I introduced myself to a man named Max who manages the food counter. He turned me right around and yelled to the owner he’s here. The wide smile on Pete Morentzos face as he got up and came over to us was a telling sign that he was confident that we’d be blown away by his new pet project. He was very cordial and warm, saying hi to everyone who walked by (the man knows a lot of people and knows them by name). After chitchatting for a few minutes he yelled back to Max to take care of us and left us to go order some food. Paradise City by Guns and Roses was blaring from the speakers as we took a block of paper menus to choose what we wanted to eat. From his spot on the bench Pete called out to see if we wanted to change the music. I love GnR but no sooner had I said, no the music is great, did the low vibrating tones of Isaac Hayes fill the alleyway and adjacent parking lot. It was awesome. At QDC Burger, there are two ways to have your burger. 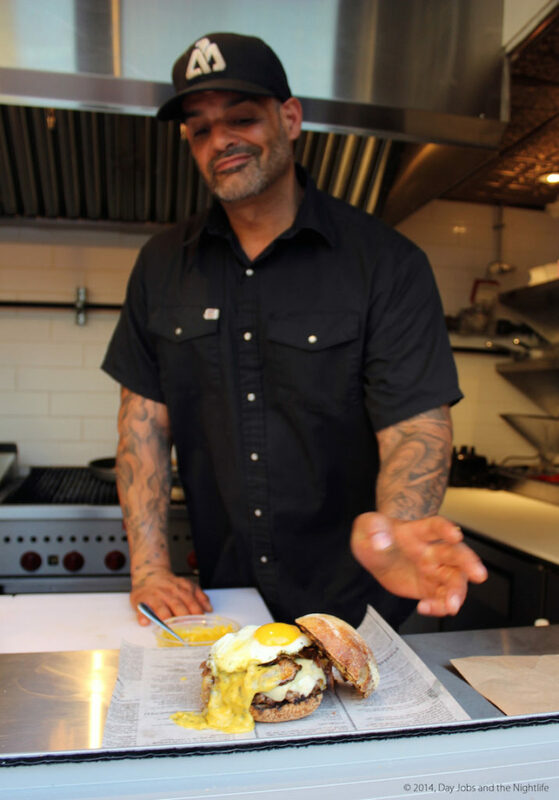 You can go for the preconceived Chef’s Burgers or you can build your own. I chose to build my own and went to town listing off ingredients like sharp cheddar, steakhouse fried onions, Asian cucumber, pan sautéed button mushrooms and pan-fried pepperoni. Not feeling that I had enough on my plate, I also tried the fries (obviously) and a Coke. After a few minutes of waiting impatiently Max shouted our names and we went to gather up our food. Wrapped in a white paper, I could hardly wait to open the food and dig into it. After confiscating part of the wooden bench, I tore off the paper and wrapped my hands around the stacked burger and took my first bite. I’ve spoken before about my love of hamburgers and this was one of those wide-eyed, oh-my-god experiences that impressed me so much I didn’t even put it down (I kept saying this is so good with my mouth full. Impolite I know, but I didn’t care). The burger’s beef is from the same supplier that provides Queue de Cheval’s much talked about steaks. 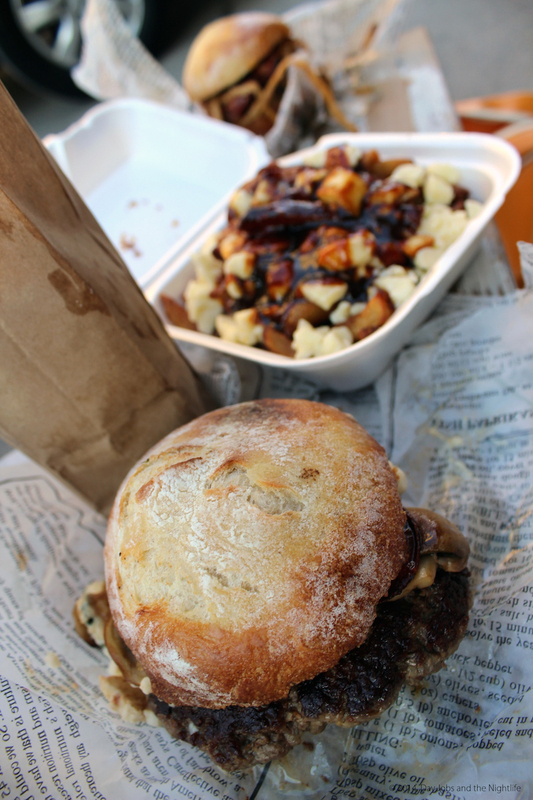 For a few minutes of burger bliss, I crouched near the bench where cheese and sauce dripped onto the paper. I finished off the burger went for the fries. They were also pretty good but it was the poutine my friend ordered that I coveted. The QDC Burger poutine is out of the world. Made with their golden fries and cheese curd nuggets, their sauce is a veal and wine reduction. It was savory, sticky and lightly sweet and I was going to finish that too until the plastic fork was pried from my hand. As we were finishing up, Pete came back around to see how we were doing. I was entering a food coma when he told us there was something else he wanted us to try. He walked over to the large tattooed chef behind the window and a few minutes later he returned with another burger, the Jefferson (pictured above; named after Jefferson Davis who lived at 1181 de la Montagne, Queue de Cheval’s new address, just after the Civil War). 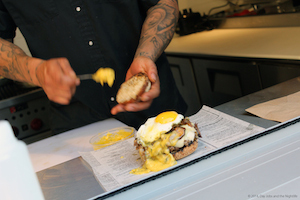 He handed us the halved burger, which was topped with pulled braised Short Ribs, swiss, white cheddar, sautéed mushrooms, an egg, sunny side up and a delicious Béarnaise sauce. As one of the eight chef’s burgers on the menu, the Jefferson was delicious, full of flavor and a must try for any foodie. Eating at QDC Burger was an experience all to itself. It was an authentic Montreal food experience that will have all sorts of people lining up to try it. On Fridays and Saturdays they are open until 5am and the weekdays they close up shop at midnight and they will have a year round schedule. I love the idea of a mixture of Montrealers gathering late into the night, starving for food and enjoying these amazing burgers. It is with the best of intentions that QDC Burger was born and with the name Queue de Cheval fronting this unique must-try burger joint, in the end, as always it will be about the food.